From Altavilla Mllicia, Italy to Chicago. Hours by plane, a century away in tradition, and what seems to be a lifetime ago. The Pete's Pizza story began back in the 1950's located right behind the old Riverview amusement park on Belmont and Western Ave. and now in the Edgewater neighborhood as well. 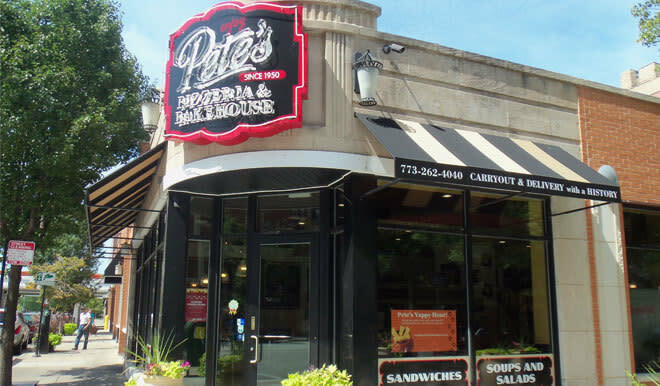 Pete’s became an instant hit with locals, serving our famous thin crust pizza and homemade Italian dishes. Each pizza is hand made with love using fresh ingredients that give you an endless choice of combinations. Our legendary pizza is created with our fresh tomato sauce and baked to perfection.